Surface Pro has become an iconic design now, and perhaps it shouldn’t be too surprising to see more of an evolution in a new launch than the revolution we sometimes hope for. As the saying goes, if it’s not broke, don’t fix it, and there’s a lot that’s not broken on the Surface Pro design. Ever since moving to the 3:2 aspect ratio back with the Surface Pro 3, Microsoft has seen the other manufacturers imitate their design, with varying levels of success. 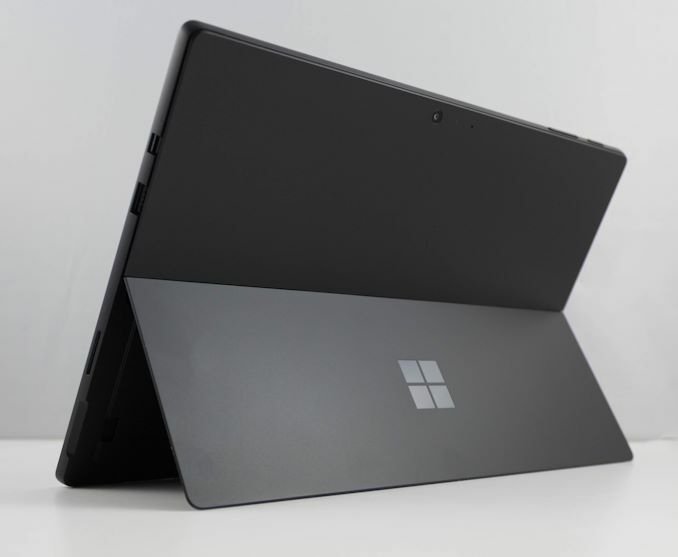 Surface Pro 6 keeps the unibody magnesium design relatively unchanged from the 2017 model, with the same rounded edges, and exactly the same exterior dimensions. Weight is almost identical as well, with the Core i5 model coming in at 770 grams, and the Core i7 slightly heavier at 784 grams to account for the fan. 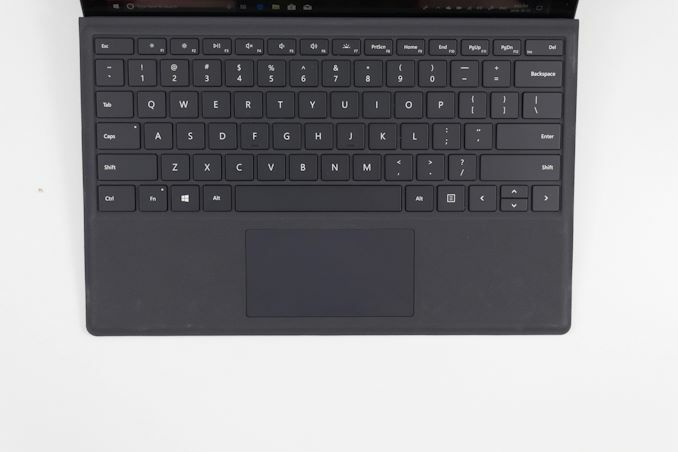 Really, the big change on the design front is the new black color, which as you’d expect on an all-metal device like the Surface Pro, is an anodized finish. The new color option does look striking, especially with the Microsoft logo as a contrasting reflective finish. Microsoft will still be offering the platinum color they’ve been using since the Surface Pro 3. There’s got to be a concern that the black finish won’t be as durable, and any scratches will be immediately apparently, whereas with the platinum finish, scratches would be masked by the color of the metal underneath, but that how durable the finish is will require a longer evaluation. Surface Pro keeps the same bezel sizes, and with the move to thinner and thinner display bezels, it does look a bit out of place compared to something like the Huawei MateBook X Pro, but since the Surface Pro can also be a tablet, it makes sense to keep some bezel in place as somewhere to hold the device when necessary. Microsoft has been outfitting Surface with a fast and reliable Windows Hello camera since the Surface Pro 4 launched, and the latest model continues this. The sign-in process is simple, fast, and secure, and it’s hard to say if it’s better than the previous model since both work so quickly. Being so small and light, Surface Pro is incredibly easy to travel with. 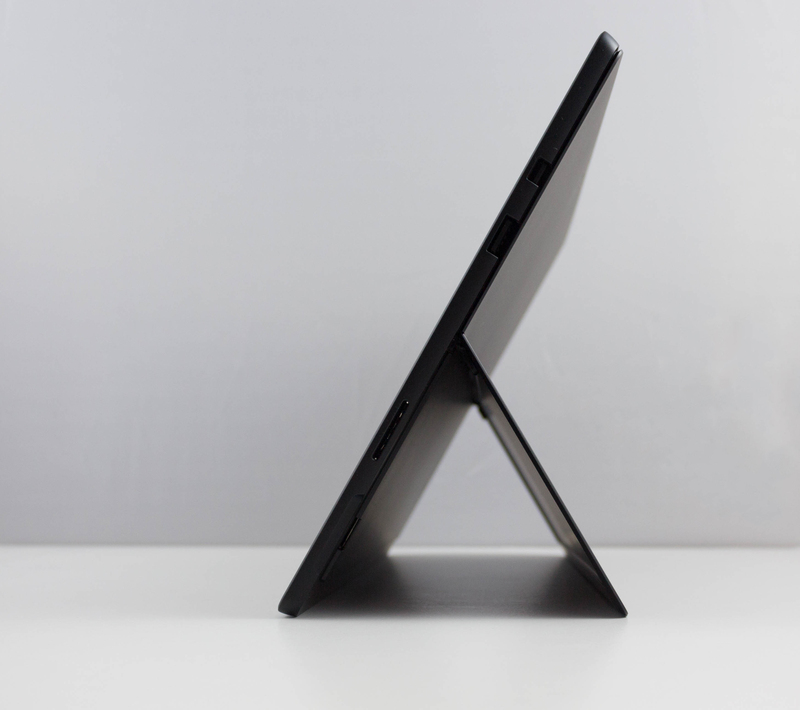 The full-friction hinge mechanism lets you use the tablet in an infinite number of positions as well. If you are someone that often types in their lap while traveling though, convertible tablets are generally not as user-friendly as laptops, although it can be awkwardly done if needed. Along with things that have not changed with this launch is the lineup of accessories for the Surface Pro. 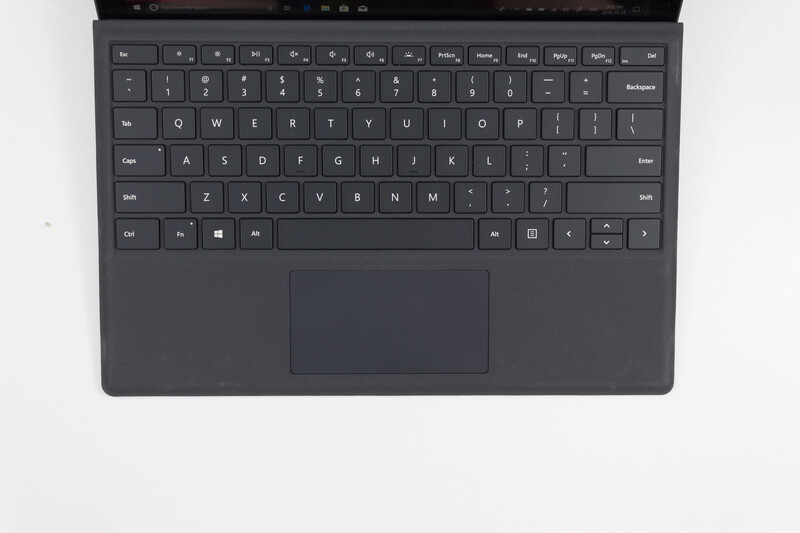 Every Surface Pro practically requires a keyboard, and Microsoft offers several to suit the customer’s preferences. The standard Type Cover costs $129.99, and comes in black. 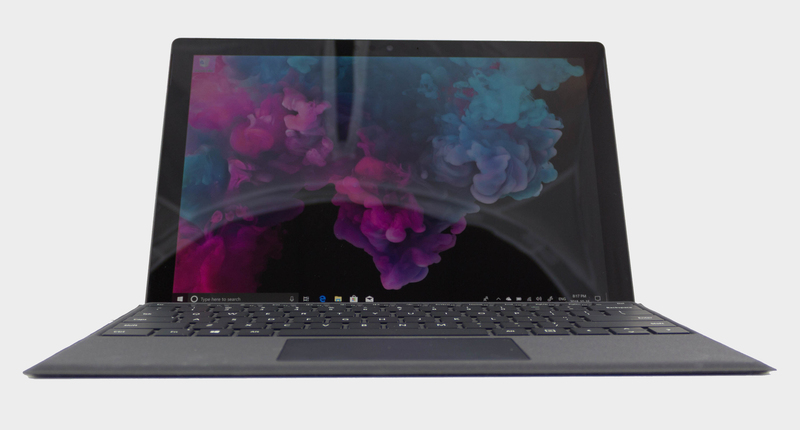 If you want a more premium experience, Microsoft also sells the Surface Pro Signature Type Cover which features an alcantara cover, and this model comes in platinum, cobalt blue, burgundy, and black for $159.99. At one point these prices seemed extravagant for a keyboard accessory however Microsoft seems conservative in regards to pricing compared to Apple and Google. The typing experience on the Type Covers is solid, with good key feel, and the keys stretch to the edges of the cover. The glass trackpad is also excellent. The covers haven’t changed much since they were introduced with the Surface Pro 4, and for good reason. 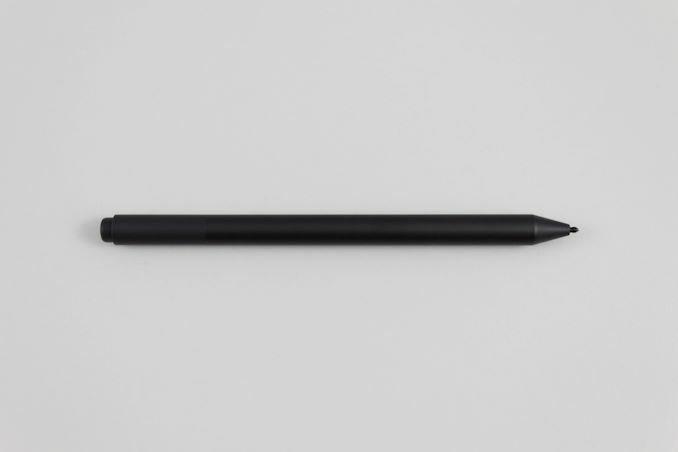 Microsoft also offers a Surface Pen option, and although the pen was once included in the purchase price, it’s now a separate accessory, but that does give the option of different color pens. 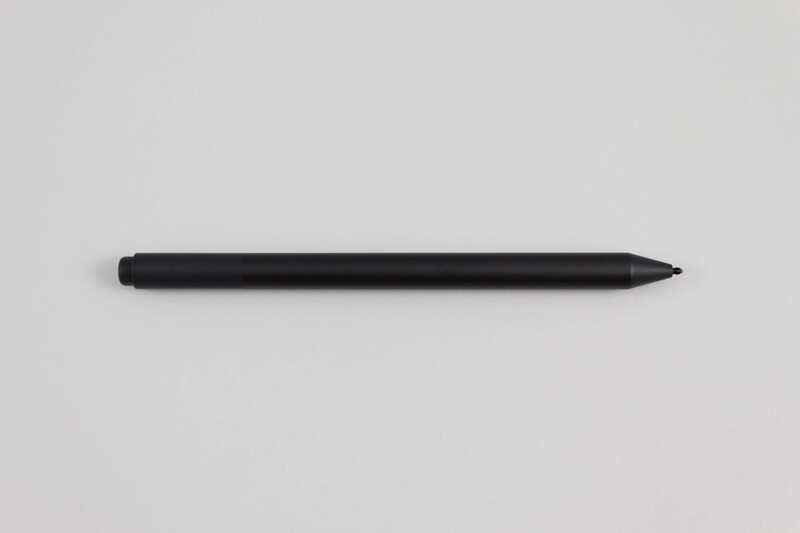 The pen was improved dramatically with the previous 2017 Surface Pro, offering more pressure sensitivity, as well as tilt support, and has kept the Surface tradition of replaceable tips as well. So for 2018, this accessory is also unchanged, but with the improvements last year, the inking experience on Surface Pro is already excellent. Microsoft also offers a docking solution, which hooks up to the SurfaceConnect charging port, and provides two DisplayPort as well as Gigabit Ethernet, four USB 3.0 ports, and audio output. The downside to this dock is that the two DisplayPorts are fed from the same channel, so you are limited to a single UHD output at 60 Hz, and if you try to connect two UHD displays you’ll end up stuck at a 30 Hz refresh rate. Ironically, Microsoft also sells a SurfaceConnect to USB-C adapter. This seems to be their solution to people who would like USB-C, especially for docking, but it has the same limitations as the Surface Dock being only able to feed a single UHD display at 60 Hz. It is possible to connect a second display to the DisplayPort output on the Pro 6 itself, but that does get a bit messy as far as cabling is concerned. What would be preferable is to offer the USB-C right on the Pro 6 rather than sell a dongle.